In this classic work of spiritual guidance, the founder of the Rochester Zen Center presents a comprehensive overview of Zen Buddhism. 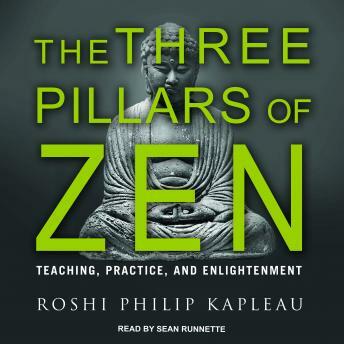 Exploring the three pillars of Zen-teaching, practice, and enlightenment-Roshi Philip Kapleau, the man who founded one of the oldest and most influential Zen centers in the United States, presents a personal account of his own experiences as a student and teacher, and in so doing gives listeners invaluable advice on how to develop their own practices. Revised and updated, this edition features a new afterword by Sensei Bodhin Kjolhede, who succeeded Kapleau as spiritual director of the Rochester Zen Center. A moving, eye-opening work, The Three Pillars of Zen is the definitive introduction to the history and discipline of Zen.